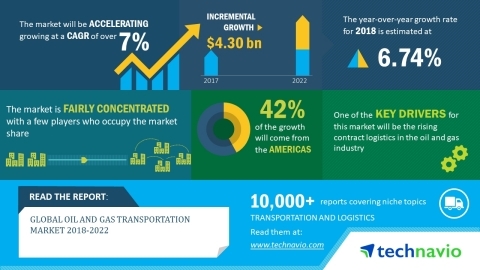 Technavio market analysts forecast the global oil and gas transportation market to grow at a CAGR of nearly 7% during the period 2018-2022, in their latest market research report. One of the major trends being witnessed in the market is the emerging advanced oil and gas pipeline transportation monitoring technologies. The pipeline system is usually used for the transportation of oil and gas. The pipeline transportation system for oil and gas avoids fatal accidents as oil and gas are hazardous in nature. This is the major concern for oil and gas companies. Owing to improved technologies, many new monitoring systems are being used in the oil and gas pipeline transportation system to ensure the safety of pipelines as well as people working on these pipelines. The logistics functions of companies in the oil and gas sector are handled in-house to have complete control over the business. But, with the business landscape becoming increasingly complex and competitive, companies are shifting their focus toward their core businesses. Logistics can consume a considerable amount of time and resources, encouraging companies to outsource logistics services. This has increased the demand for contract logistics services. Furthermore, the outsourcing of logistics services allows customers to leverage the expertise of contract logistics providers. This market research report has segmented the global oil and gas transportation market based on mode of transportation (pipelines, railroads, and tankers and trucks) and key regions (the Americas, APAC, and EMEA). It provides a comprehensive analysis of the prominent factors influencing the market, including drivers, opportunities, trends, and industry-specific challenges. The Americas led the global oil and gas transportation market in 2017 by contributing to a market share of more than 37%. It will continue to dominate the global market throughout the forecast period. The market share of this region is anticipated to increase by nearly 1.5% by 2022.
a massive 20% OFF on all non-alcoholic beverages reports for the entire month. whopping 30% OFF on all cosmetics and toiletry reports. Offer valid from 7th May for a limited period.